It’s pretty clear from this blog and my social media that I don’t need a special occasion to purchase from DAVIDsTEA but that doesn’t mean I don’t get excited about some gorgeous holiday gifts. With Valentine’s Day less than a week away, I thought I would share some great DAVIDsTEA Valentine’s Day Gifts* that you can pick up for a significant other, or for yourself! Every year DAVIDsTEA comes out with a small Valentine’s Day collection (click here to check out last year’s) and this year I received a few of those products to share with you. This romantic collection includes several festive teas, and some gorgeous teaware such as mugs and travel mugs, as well as an infuser, tin, and even a shortbread and chocolate bar option. One of the cutest gifts is definitely the DAVIDsTEA Love Tokens, which is a $12 booklet that includes 5 tea-inspired messages that can each be exchanged for free tea. You can give the whole booklet to one person, or divide it up for 5 tea-loving friends. 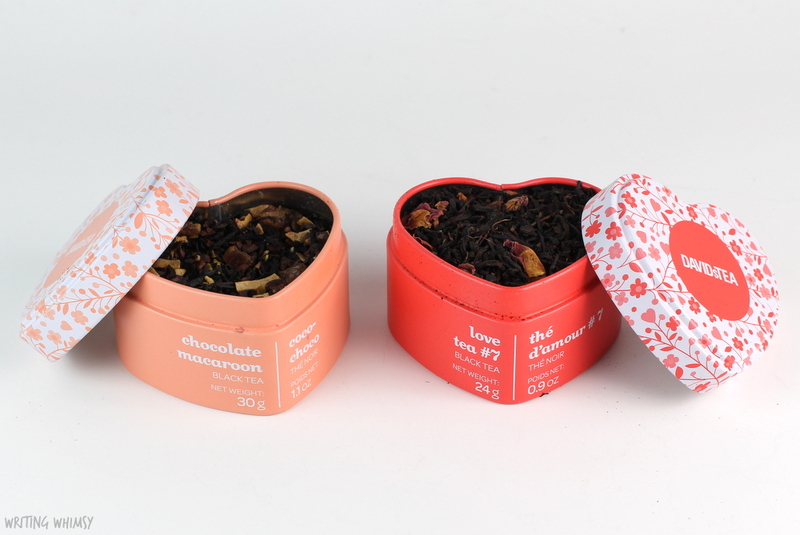 In terms of the tea options, I’m excited to see the adorable Heart-Shaped Tins are back. I have the DAVIDsTEA Chocolate Macaroon and Love Tea #7 Heart-Shaped Tins, but there are also Dark Chocolate Delight and Cherry Blossom tins. These stackable tins each contain 21-30 grams of tea. DAVIDsTEA Cherry Blossom is actually one of the few white teas (possibly the only white tea?) I really love and it was first released as a Valentine’s Day Tea a couple years ago and sold out almost immediately. I’m not sure I had tried either of these 2 teas before, but I really enjoyed both of them. DAVIDsTEA Chocolate Macaroon is a black tea with coconut, pecans, cacao nibs and rock cane sugar. It’s a sweet, slightly nutty and chocolately tea that’s very smooth. I bet it would also make a delicious latte. DAVIDsTEA Love Tea #7 is also a chocolatey black tea, but it has rose petals and berries as well which gives it a light fruity, floral undertone. Of course if you have delicious tea, you need a mug to drink it in and honestly I think the DAVIDsTEA White Hearts Simplicity Tea Mug would pair perfect with some tea for a gorgeous Valentine’s Day gift. 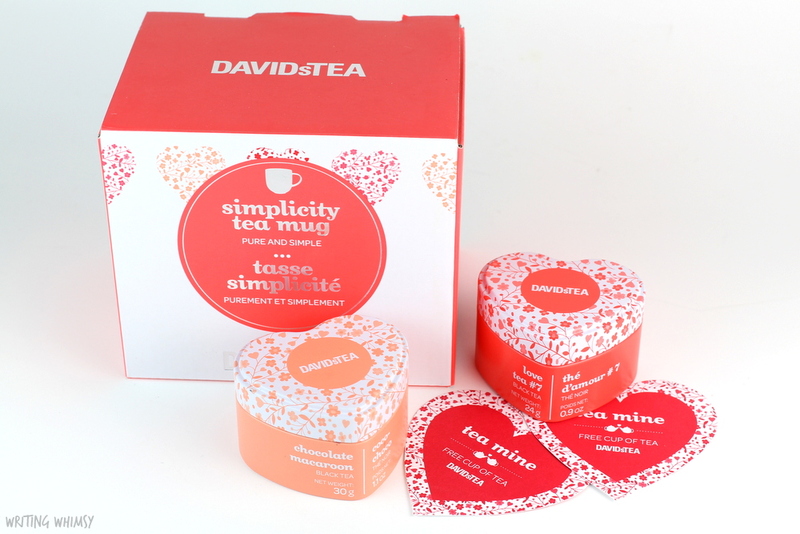 It was interesting to see that there were two Simplicity Tea Mugs in the DAVIDsTEA Valentine’s Day Collection but no Perfect Mugs or Nordic Mugs (my favourite) since this style does not come with an infuser. That said, there is a really adorable Pink Heart Infuser in the collection. I really love the quality of DAVIDsTEA mugs as I find them very well-made and with gorgeous designs, so the DAVIDsTEA White Hearts Simplicity Tea Mug is no exception. This limited edition porcelain mug has a peachy-pink interior and white exterior with a floral heart design repeated in different colours. It’s both festive, and also something that could be used year-round without feeling out of place. 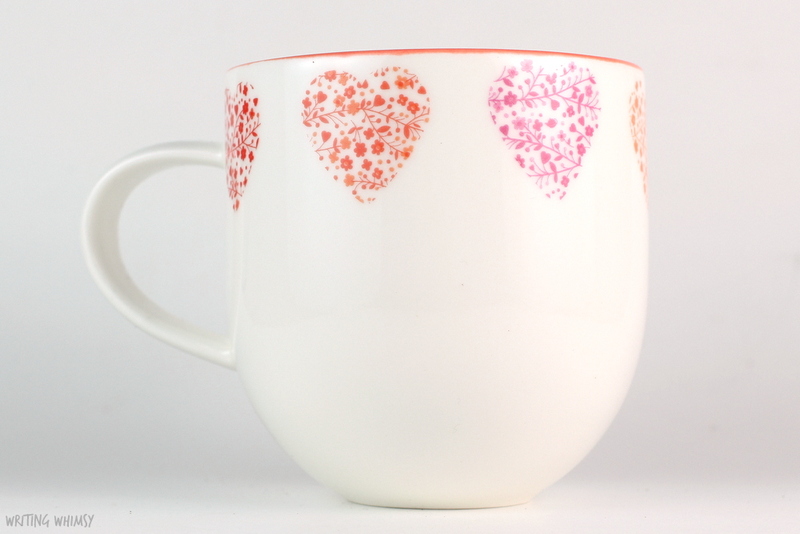 There’s also a Pink Hearts Simplicity Tea Mug with the reverse design–hearts on the inside, pink on the outside. It doesn’t matter what holiday DAVIDsTEA releases products for, if there are new mugs and teas available I’m going to want to purchase some. 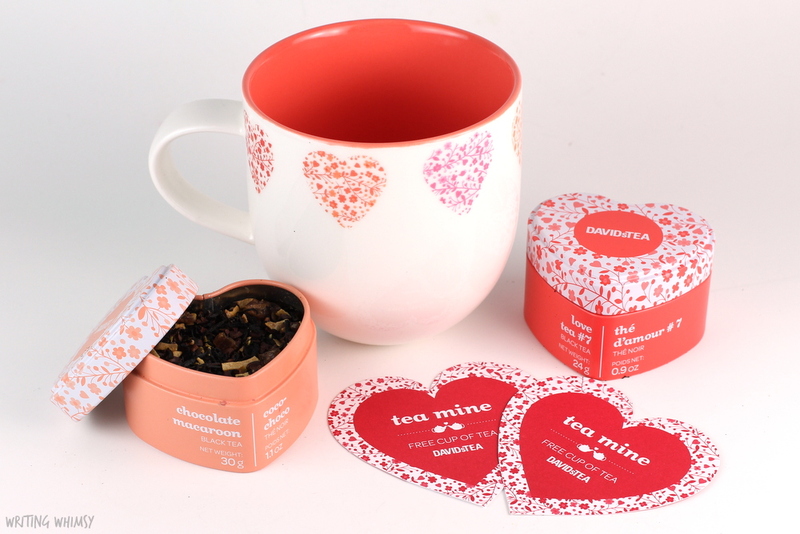 These gorgeous DAVIDsTEA Valentine’s Day Gifts would be a great treat for the tea lover in your life, even if that person is yourself! 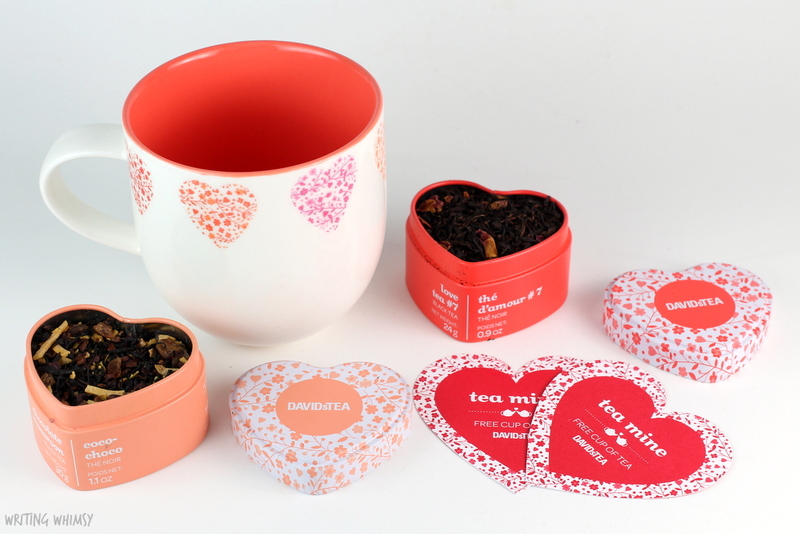 Will you be picking up any limited edition DAVIDsTEA products for Valentine’s Day?